BGFF believes that if intensive logging proceeds in Warrup blocks high conservation value forests, firstly in compartment 6 as scheduled, then in compartment 8, an environmental injustice, with publicly unacceptable consequences that could have been prevented, will have been done to these important south-west forests. Our view is that the current logging proposals will do irretrievable long term damage to biophysical conditions and biodiversity both in the logged areas and other contingent forest areas of Warrup. The intensive logging proposed will have additional adverse collateral effect on other natural values expressed in the Warrup forests as climate change continues to affect them. 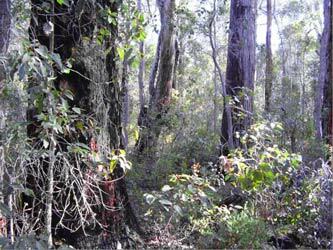 Warrup block is an integral part of the Greater Kingston region which has biological values of state and national significance as one of the most important rare and threatened fauna refuges in the south-west forests. Considerable criticism has been made by the Conservation Commission in its mid-term audit report of numerous sustainable forest management shortfalls which effectively constitute breaches of the Forest Management Plan (FMP) by the Department of Environment and Conservation (DEC). Additional public criticism of that agency has been made by the Auditor-General specifically relating to management of threatened fauna and flora. In view of this, we wish to express our further serious concern that the planning for intensive logging in Warrup is proceeding without any comprehensive and detailed field based fauna and flora investigations by forest management in compartment 6. The Environmental Protection Authority is due to respond to the Conservation Commissions mid-term audit report soon. This response can be expected to contain important assessments and evaluation of forest management in W.A. pertinent to the critical environmental issues we are raising concerning the significance and future of Warrup block. In view of both these circumstances, and the significance of the precautionary principle as a key element of sustainable management of forests, we strongly believe that logging in Warrup should be deferred pending comprehensive fauna and flora studies and completion of government consideration and public processes associated with the forthcoming Environmental Protection Authority report. 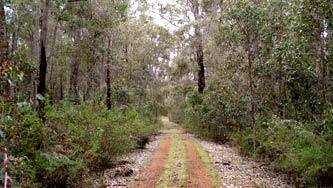 Above: Old-growth forest in Warrup 06. Logged once only by selection logging in 1940s from the railway line. Below: Area scheduled to be logged; Millar Rd Warrup. Bridgetown-Greenbushes Friends of the Forest (Inc) is a local group with international standing. Founded in 1987 and working to save native forests in the Shire, BGFF is also a member of international groups such as Friends of the Earth International, and the Forest Stewardship Council International, with Dr Leonie van der Maesen as our delegate. BGFF members such as Jim and Mary Frith and friends have worked tirelessly for twenty years to preserve what they could of forest areas in the Shire that were to be logged. Their successes include the Greater Kingston National Park, the Hester Conservation Park, Dalgarup National Park and other smaller reserves. BGFF has been prepared to fight for local forests and has taken cases as far as the High Court. Although these cases were not successful the end result was that the forest areas concerned are now part of Bridgetown's heritage as National Parks or conservation reserves.